Reaching The Goal explains not only the basics of TOC, but how it improves business performance, using experiences from IBM research to document using TOC in services businesses. From its basic principles to applications in different areas of business, TOC is thoroughly covered including guidelines on how to implement in an existing organizational structure. 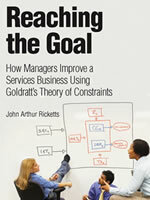 Author John Ricketts thoroughly adapts TOC to the needs of today's professional, scientific, and technical services businesses and reveals how to identify the surprising constraints that limit an organization's performance, execute more effectively within those constraints, and then break or even eliminate them. This book's relentlessly practical techniques reflect several years of advanced IBM research and consulting with enterprise clients. Step-by-step, Ricketts shows how to apply them throughout your most crucial business functions...from project management to finance, process improvement to sales and marketing.